I love cooking... For its therapeutic nature, and partly because my taste buds do fuss a lot. By far, I do not adhere to any recipe, dread the use of any measuring equipment and the aftermath of cooking (washing, scrubbing, wiping etc.) More subtlety put, free-style and intuitive or you may call it lazy. For the next few posts, I'm going to share with you my experiences in cooking. I usually cook individual portion for just myself, and when I have gatherings, it would then be more towards tapas-style. I won't say that my recipes are original. They are more of inspirations or motivations derived from other meals. I feel once you start to get your creativity working, cooking can be rather simple. Many may find it not worth the hassle just to cook for an individual portion. It can be tricky when comes to buying the ingredients - too much for too little used. To counter that, I try to use more versatile ingredients that allows me to create a variety of dishes throughout the week and those with a longer shelf life means you don't have to worry buying too much of it. Using pre-mix sauces can be one of the ways to help lighten your load. They enable you to create the flavour without you having to purchase the numerous ingredients. I was really disappointed with a minestrone soup which I tried recently in a restaurant. 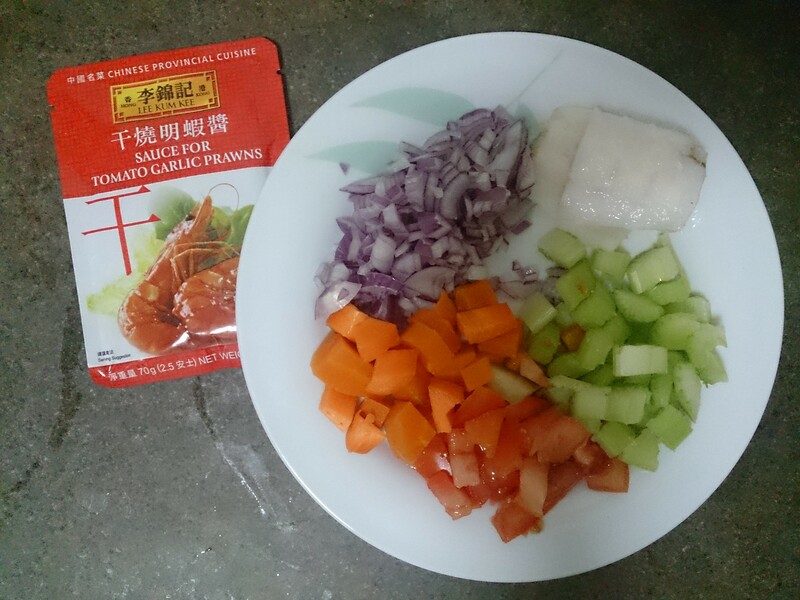 Hence, the very first dish that I am going to share with you is my own version of Minestrone Soup made using Lee Kum Kee Sauce for Tomato Garlic Prawns. Soup is usually the first dish I would make for the meal as time is needed to get the goodness out of all the ingredients. By the time I am done with the rest of the dishes, the soup will be just ready in time together with the rest. I love making soups, because I just need to put everything into a pot and leave it alone. For this minestrone soup, it's the same. 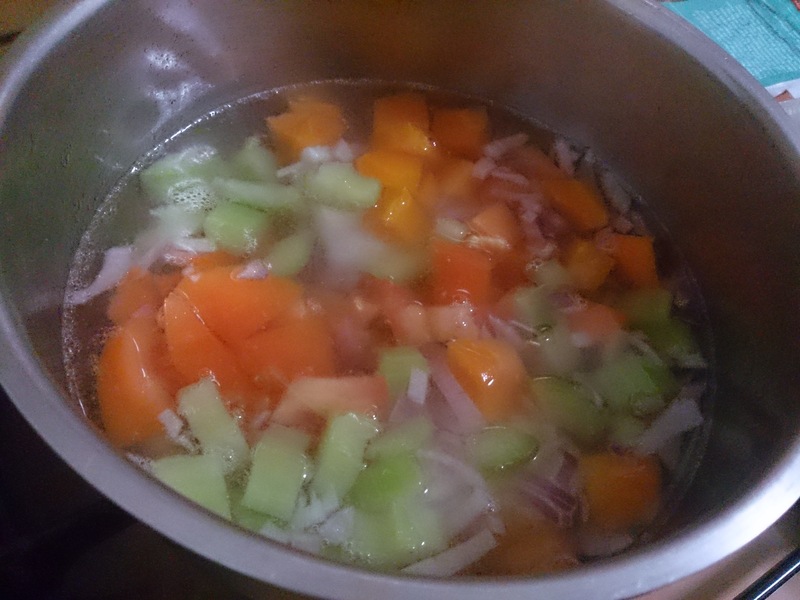 Simple ingredients - onions, tomato, carrot, celery. As I'm not of a meat person, I used cod fish bones in place of pork ribs or chicken bones to give the soup some sweetness and viscosity. After the water came to a boil, I threw in all the ingredients and let it boiled for 20 minutes in medium heat. As all are hardy vegetables, I do not need to worry about overcooking them. If you prefer, you may add some white pepper corn to spice it up a bit, especially on wet days. After 20 minutes, the vegetable cubes were pretty soft. I mixed in 2 tablespoons of Lee Kum Kee Sauce for Tomato Garlic Prawns into the soup and let it simmered in low heat for another 10 minutes for the ingredients to soak in the flavour. 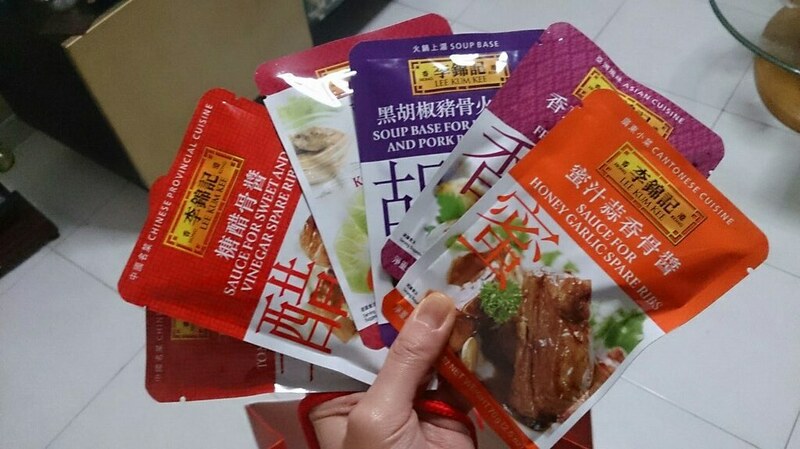 I think sweet corns, leeks or even potatoes very suitable for such vegetables soups as well. To make it even more sumptuous, seafood such as prawns, squid and white fish will make the taste more robust. On lazy days, a hearty soup makes the best meal. 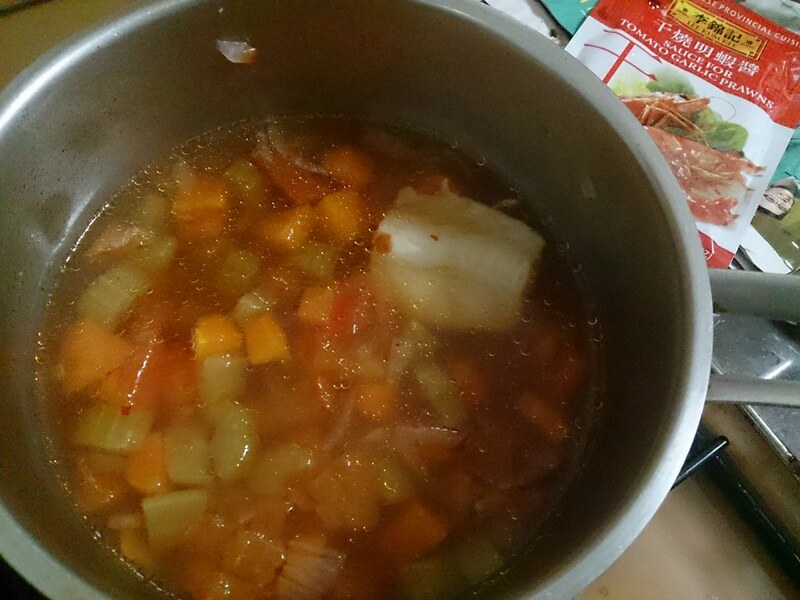 - Optional: Other vegetables e.g sweet corns, leeks, potatoes, or seafood such as prawns for a more hearty soup. 1) Dice all the ingredients. 2) Bring the water to a boil. 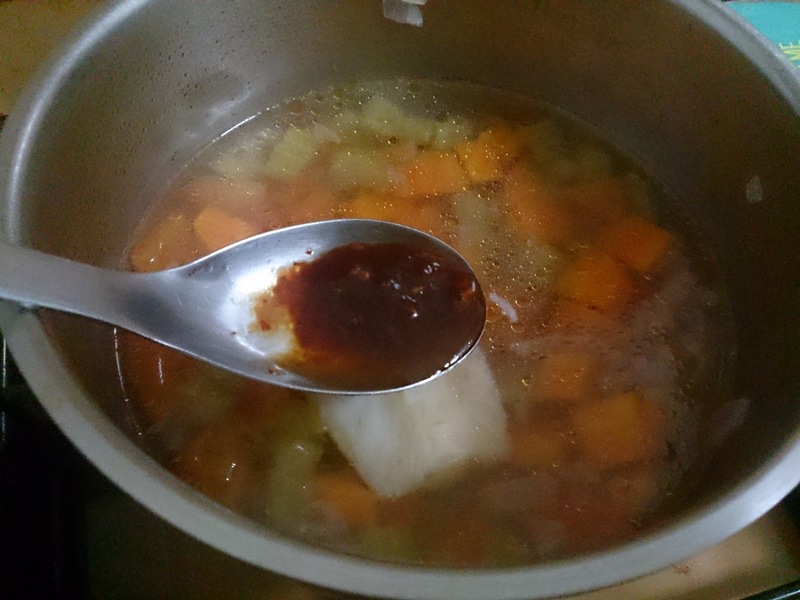 3) Put in all the vegetables and let it boil for 20 minutes. 5) Simmer for another 10 minutes or more for a thicker broth.